What is better than recieving the best gift? 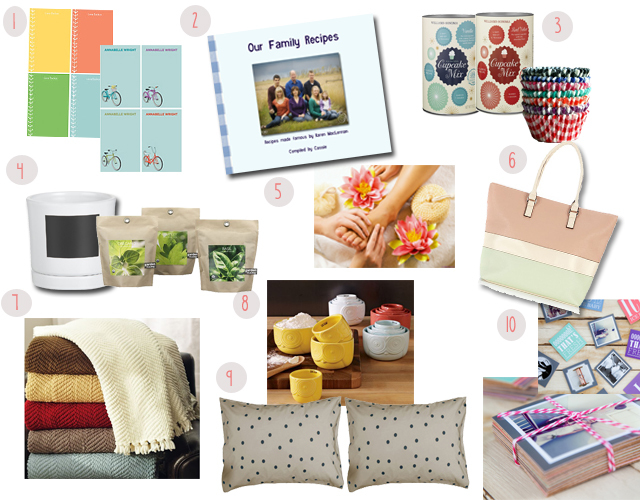 pretty gift ideas for our mom's. These also happen to be things I want horribly. 1. Personalized Notepads from Paper Source. Anything personalized is so personal and moms love lists. 2. A DIY cookbook with all your favorite family recipes. The one pictured is what I did last year for Mother's Day. It was quite the undertaking since I made all the recipes to photograph but I loved giving it to my mom, and having my own copy. I made it on Picaboo.com, here is a link to mine if you want an example. 3. Williams-Sonoma cupcake mixes+gingham cupcake liners. These are for the baker mom who will make stuff from a box, and from WS box how bad can it be? Cupcake mixes here and liners here on etsy. 4. Chalkboard Herb Potters and herbs. Mom's tend to have green thumbs. 5. A Pedicure. Can you ever go wrong with a pedicure? 6. New Purse/Beach Bag/Book Bag. This pastel bag would be perfect for the beach, throw in a book she has been wanting to read inside. 7. Chenille Throw. My mom has a thing for blankets and she is always cold. This one is from Pottery Barn and looks so cozy and scrumptious! 8. Owl Measuring Cups. Found these at West Elm, they would be so fun for mom's with little one's or just for mom's who love to bake. 10. DIY Picture and Quote Coasters. For a more affordable option, these are SO cute and you can put anything you want on them. Pair them with a cute mug and a box of her favorite tea or hot chocolate! Great Tutorial for coasters found here. Ps. I couldn't showcase on this list what I actually got the mother's in my life, didn't want to ruin the surprise, so sorry mom, don't get your hopes up! Hope this list gives you some inspiration on what to get the amazing women in your life. oh i love those pillow cases! I love any and all of the above!!!!! I just found your wonderful blog through Adventures of Newlyweds and I am am so excited to start following! You and your husband are the cutest couple! what a great list and i love the idea of family recipes! Send gifts to pakistan gift giving occasion. I think it was a lovely and unique collection of gifts for mothers day. I would love to use them for Send gifts to Pakistan on mother's day. Being a male I always have trouble finding a gift for mothers day. I know that I cant go wrong with a gift basket for women. These are also some very good ideas that I will look into. Thank you very much for posting them.